Pennzoil Platinum is an advanced full synthetic motor oil. It's continuously attacks potential and stubborn deposits to help keep vital engine parts clean. In fact, Pennzoil Platinum keeps your engine up to 40% cleaner than current industry standards. The ability to clean up your engine helps maximize engine protection and responsiveness. 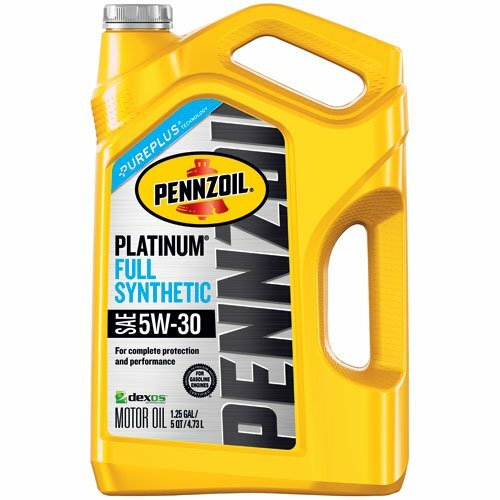 Pennzoil Platinum is designed to provide our superior cleansing under the most severe driving style or conditions to maximize engine responsiveness. If you have any questions about this product by Pennzoil, contact us by completing and submitting the form below. If you are looking for a specif part number, please include it with your message.